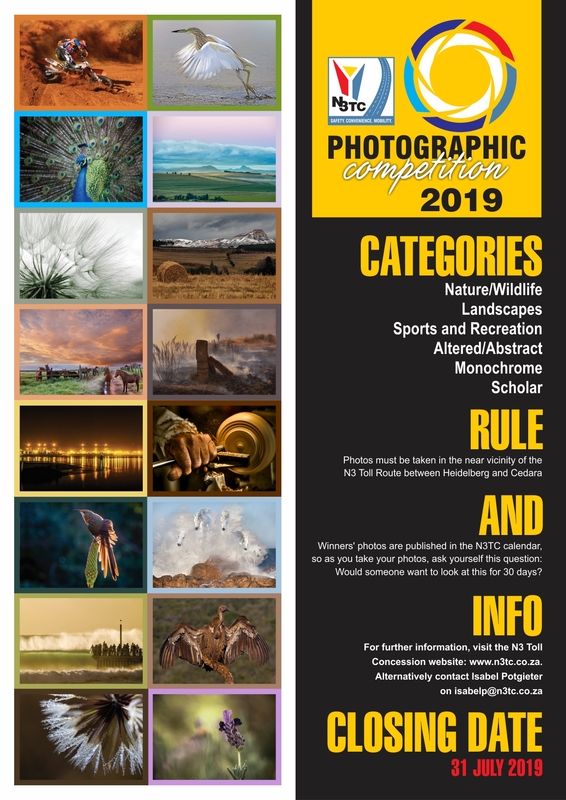 The primary aims of the competition are to promote the vicinity of the N3 Toll Route and to encourage photography as a hobby, especially among local communities and scholars. All entries must be accompanied by the official competition entry form which can be downloaded here. Please note, a separate entry form is necessary for each photograph submitted. The images, together with their relevant entry forms, must be e-mailed to isabelp@n3tc.co.za with the subject line: N3TC Photographic Competition. You may also send your images/forms via WeTransfer should the file size exceed 8 megabytes, and send the link to isabelp@n3tc.co.za. The competition closes at midnight on 31 July 2019. No late entries will be accepted. Photographers can enter a maximum of three photographs per category. Nature/Wildlife Photography: Displays of natural elements such as wildlife, plants, birds, insects and close-ups of natural scenes and textures captured in their natural environment. Full colour only. Landscape Photography: Covers landscapes, panoramics, mountains, weather phenomena and farmlands. Human or manmade elements may be present. Full colour only. Sports and Recreation: Involving unpredictable movement, this could include movement or action at a sporting event or festival, and vehicle and recreational activities. Full colour only. Altered/Abstract: A photograph that has been technically manipulated. This could include abstract, high-dynamic range, stitched and composite images, among others. Full colour only. Monochrome: Any photograph that falls into the Nature/Wildlife, Landscape, Sports and Recreation or Altered/Abstract categories that is of a single colour – monochrome (black and white, sepia, etc). Scholar*: Photographs that fit into any of the above categories. * To qualify for the Scholar prizes, the photographer should currently attend a primary or high school and be 18 years or younger. Photographers who turn 19 during the competition will still be eligible to enter this category. All information as required on the entry forms must be provided. Each individual image entered into the scholar competition must fit in any of the listed competition categories. Photographs must be taken in the near vicinity of the N3 Toll Route (Cedara in KwaZulu-Natal to Johannesburg in Gauteng) and should be supplied in digital format with a minimum size of 2 MB. A high-resolution version of the entry photo must be available.